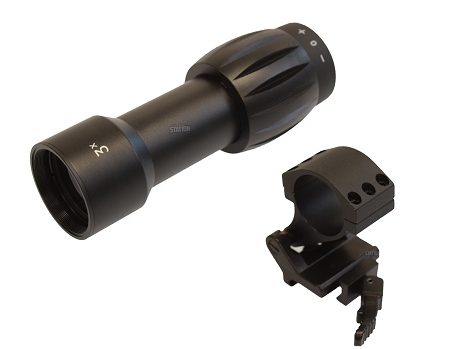 he Generation 2 AMP Tactical 3x Magnifier is designed to be used with other optics such as holographics and red dots to improve vision over longer distances. The benefits of a magnifier over a traditional scope are twofold. The first benefit is that a magnifier can be used with many other optics that a shooter may currently own, without the limitations of sometimes bulky scopes with limitations on features such as lumination or variable crosshairs and dot types. The second is that it can easily be added or removed giving the operator the ultimate flexibility for any situation that may come up during an operation on the field. This magnifier comes with variable focus making it perfect for almost all users.